Scientists discovered more than 90 giant dinosaurs tracks in a quarry outside the German city of Hannover. 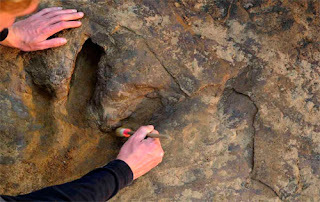 The scientists said the foot prints belonged to a long-necked dinosaur and are supposed to be between 135 and 145 million years old, from the Cretaceous period, The Local news portal reported. They compute about 1.20 metres in diametre and stretch over 50 metres. "What is unusual about the tracks is that they go along for a long distance and then the dinosaur makes a sharp turn - that is exceptional," said excavation director Benjamin Englich. He added that the footprints were "astonishingly deep", measuring 43 centimetres into the ground. "The foot-shape and type of step taken is very typical for long-necked dinosaurs. They left behind elephant-like footprints," Englich said. According to the researchers, when the dinosaurs roamed during this time, the area had a tropical to subtropical climate. There was maybe a huge lagoon area with frequent islands at that time and the long-necked dinosaur would have roamed around from island to island through the low water, looking for food, they added.